Do you remember your very first training session? The thrill of expectation the first time you try a sport you like. The desire to learn something new and exciting. In my life I trained judo, skating and dancing (briefly and unsuccessfully 🙂 ), volleyball and basketball. I still remember every detail from each first day of training. The first volleyball training, back in 1986, when my first coach Mocko Stevan brought me to a bunch of boys three years older than me, and with a deep voice gave me my first lesson in volleyball: “When the ball hits you, it doesn’t hurt.” At the same time, without a second of warning, he threw the ball hard at my forehead,from a distance of 1 meter. I remember that my forehead was red and my ears were ringing from the pain… An interesting lesson to begin☺. 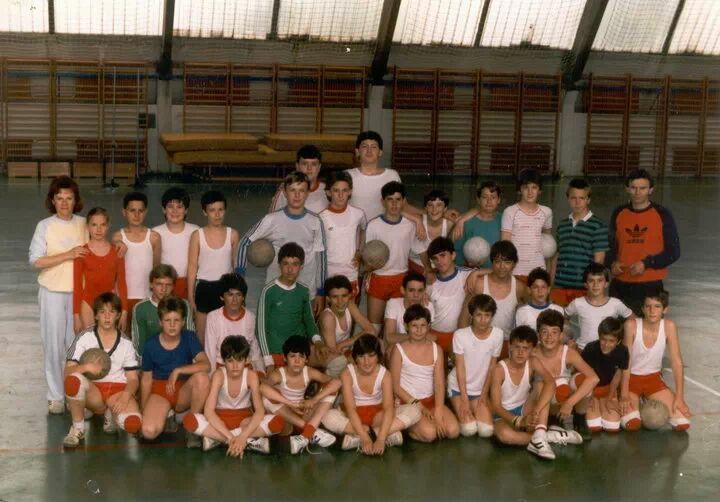 I also remember a certain Djokovic (an older boy from school), who after 2 minutes asked me if I wanted to play with them (I did not know the rules, or how to play, nor what is the point in volleyball). I did not know anything about volleyball. I was ready to learn. I had the will to carry the heavy metal bars that hold the volleyball net every session, day after day, in order to prepare the court for practice. Nevertheless, I was the youngest, so it was my duty. We didn’t care about money then, or clubs, statistics, whether we played good or bad. The only thing that was important was having a good time, playing and enjoying the game. Having fun. Pause now for a moment, and think about how much fun you have with your sport while you practice. Or maybe your job? Is there still space for just playing and having fun, just like the kids are doing … as you may have done in the beginning? If you are still having fun, then just keep going. If you are not feeling that child’s desire for something new and fun, maybe it’s time to change your sport or find something else you really enjoy. Because if you really aren’t enjoying yourself fully, then it makes no sense to train (or work), to spend hours and hours on something that you don’t like and which doesn’t fulfill you. Your inner child is the one that wants to play and to have fun. Your inner child doesn’t know its limits, nothing is difficult and everything is possible. Your inner child does not rationalize, it is driven by emotions and enjoys the game without thinking of outcomes or consequences. Your inner child enjoys the whole process. If it wins that’s fantastic, if it loses, there’s always the next game to be entered with the same passion. You should always think of your teammates as friends from your street, with whom you have gathered just to beat the boys from the neighbouring yard. This is the thing. Childlike play, passion and energy is often lost whilst growing up. The top players and sportsmen never loose their inner child. If you look at LeBron, Djokovic (the tennis player ☺), Tiger Woods, Cvijićku , Atanasijević, Brakočevićku, or perhaps remember Djordjevic, Jordan , Pirmin Zurbriggen , Grbic , Škrbić, Čavić or Svetlana Boginskaya, you will see they are all having fun during competition, and having fun is one of the reasons for their excellence. They compete and play with the same passion they had when they were kids. This entry was tagged andrija geric, be the best, be your best, inner child, sport, volleyball. Bookmark the permalink. ← Oslobodite dete u vama…..